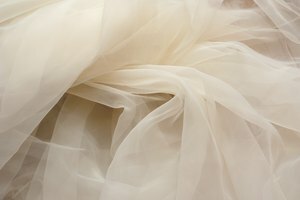 If you've ever watched Say Yes to the Dress, or been shopping for your own wedding gown, you might know some of the differences between chiffon and organza, two common materials used in bridal wear. To the untrained eye, they look pretty similar. Here are the distinct differences. Both chiffon and organza appear gauzy—whimsical and delicate fabrics that give bridal gowns princess vibes. Chiffon flows more freely, giving it a more feminine flair. Organza is stiffer; it does not flow well, but it's often used in very structured dresses that are not intended to flow anyway. Chiffon can be very soft or slightly rough but usually has a standard thickness. Organza can vary widely in thickness: thin organza is sheer and somewhat flowy, but thick organza can be as stiff as burlap. Chiffon also has a hint of sheen to it, while organza is matte. Both fabrics wear well and do not wrinkle easily. Chiffon, in particular, breathes well—perfect for summer brides and outdoor weddings. Organza is used as a feminine top layer and also to give structure to a bodice or underpin softer fabrics. It serves dual purposes in that way—appearance and function—whereas chiffon is all for show. 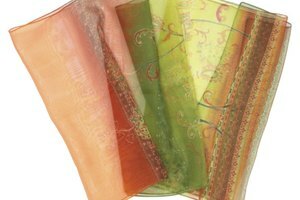 Chiffon and organza both come from the silk family. 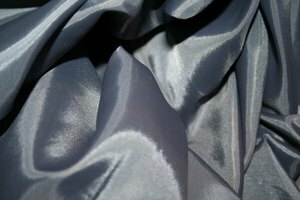 Generally, polyester or nylon is mixed with silk to create chiffon or organza fabric more cheaply. The most expensive fabrics can be made exclusively of silk. The cheapest may be made entirely of polyester. Chiffon and organza are most commonly used to make bridal gowns and bridesmaid dresses. Both fabrics are lovely for brides looking for a shimmery, airy look. Many women believe that chiffon and organza tend to hide body flaws. The price of chiffon and organza gowns depends on the quality of the fabric—silk chiffon and silk organza are the most luxurious and, therefore, the priciest. The main difference between chiffon and organza bridal gowns is the sway factor—chiffon is very flowy, while organza is stiff and structured. Brides may be the primary consumers of chiffon and organza, but both fabrics are pretty versatile. Seamstresses can make pants, shirts, scarves and skirts out of chiffon or organza. 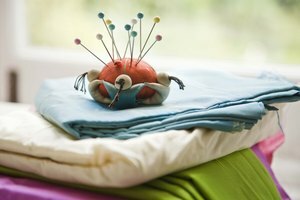 The fabrics can also be used to make crafts, or in home decor projects.